More than 375 posts. Nearly 14,000 comments. More than 4 million page views. 2014 was a great year for Scouting, and — thanks to loyal readers like you — for Bryan on Scouting. In 2014, the blog doubled the previous record of 2 million page views set in 2013. And, thanks to Senior Digital Editor Bryan Wursten, the blog’s design got a major upgrade in June. I’m also grateful for my magazine colleague, Associate Editor Gretchen Sparling, who writes occasional posts for my blog. So to celebrate 2014, let’s look at the 14 posts you gave the most “hits” to this year. The year’s greatest hits, if you will. Note: The list of 14 includes only posts published in 2014. In my honorable mentions section at the end you’ll find posts from previous years that still were getting clicks in 2014. For the two-thirds of Americans who own smartphones, it’s now possible to fit reference books, a GPS device, a weather radio, a compass, a map, a camera, a field guide, a recipe book and more in your pocket. But which of the many smartphone apps out there are best for Scouts and Scouters? Read the post. Which other merit badges made the Top 10 in 2013? What was 2013’s most-earned merit badge that isn’t on the Eagle-required list? And which merit badges were in the Bottom 10 (or “the rarest,” as I like to call them)? Let’s find out … Read the post. We are getting a new Boy Scout Handbook, but the 13th edition, due out in January 2016, will keep most of its content from the 12th edition (released in 2010). The design and images inside will be updated, but much of the text will be unchanged. Read the post. 11. Is the American flag “backward” on Scout uniforms? If you look at the right sleeve of a Boy Scout and of a U.S. soldier, you’ll see American flags on both. But there’s one big difference. While the Boy Scout’s flag has the blue field of stars at the top left, the soldier’s flag is a reverse-field flag; the field of stars is at the top right. So which is correct? Read the post. Wondering whether that parent on the other side of the meeting room would make a good Cub Scout, Boy Scout or Venturing leader? Try the Oreo Test. Read the post. Let me get this out of the way first: Belt loops and pins aren’t going anywhere when Cub Scouting gets an exciting refresh in June 2015. In fact, belt loops — now called adventure loops — and pins (adventure pins) will get even better than before with the new updates. Read the post. Here’s the story of a failed Eagle project that sparked a piece of legislation passed by the U.S. House and Senate and signed by President Obama. It’s proof that what you do in Scouting matters, even if sometimes it takes a few years to realize it. Read the post. 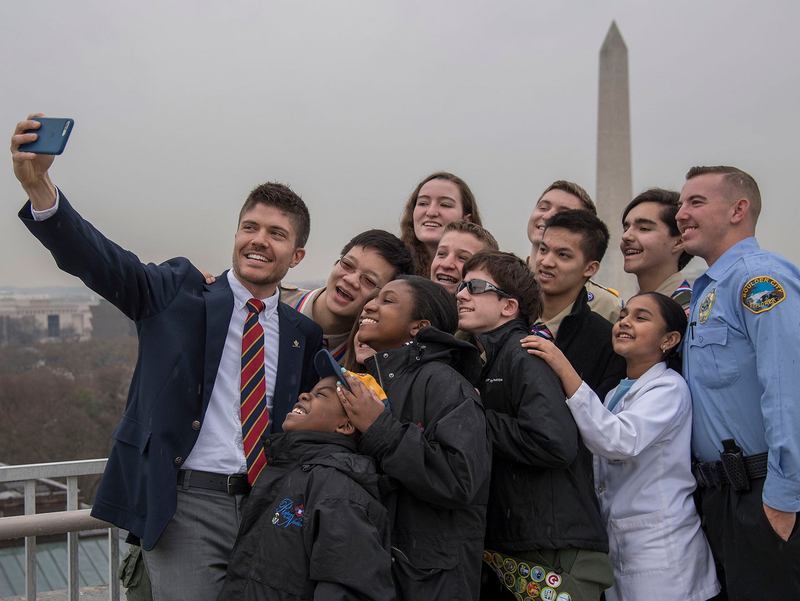 The BSA is asking for help from packs, troops and crews to stop using the phrase “Fun With a Purpose” and remove it from promotional materials and unit websites. The phrase, often used with Cub Scout-related activities, is a registered trademark owned by the publishers of the popular Highlights children’s magazine. Read the post. They’ve told us what the fox says, and now the Norwegian duo Ylvis is back with a video Scouters and Scouts should enjoy. It’s about the trucker’s hitch, a knot useful for tightening up tarp lines, securing loads or making bundles. Read the post. Eagle Scout Kenneth Shinozuka has invented a device that could revolutionize care for the more than 5 million Americans living with Alzheimer’s. And did I mention he’s just 15? The invention has already won Kenneth international acclaim — and a ton of money. Read the post. Improved activities, easier-to-understand advancement and some sweet-looking handbooks — yes, Cub Scouting is about to get even better than before. After finding that current achievements are overly passive in nature, activities lack connection to the missions of Scouting and the advancement model is too complicated, the Boy Scouts of America’s volunteer task force created a new and improved Cub Scout program that will debut in June 2015. Read the post. Scouts and Scouters love great conversations. Those digital conversations don’t have to end when you’re driving, but they do need to pause. So AT&T, which started the effort to end texting and driving, has created an ingenious, simple way to pause those precious conversations without offending the other person. It’s #X. Read the post. Frozen has made billions worldwide, but can it help make a few more dollars for Scouting? That’s what two brothers, one a Cub Scout and the other a Star Scout, were betting on when they made this parody of the song “Do You Want to Build a Snowman?” from the animated film. The 53-second video is perfect. Read the post. Scouts learn first-aid skills in Scouting without ever knowing when they’ll need to use them. Or on whom. So when a group of New Jersey Boy Scouts came upon a woman in need in April, it didn’t matter that she was NBC journalist Ann Curry. They did what any Scouts would do for any person. Read the post. Here’s the 2013 list. And the list from 2012.